Poor posture, unbalanced tight and weak muscles, overtraining, and joint dysfunction are all possible causes of low back pain, but one of the most common, as well as one that can even present with and/or cause some of the symptoms noted above is a bulging disc. 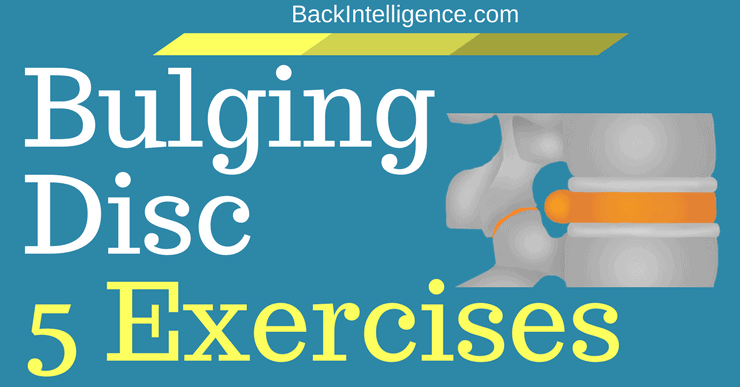 Before we dive into some natural Bulging disc exercises you can do for treatment, let’s explain exactly what a disc bulge is and the main causes. 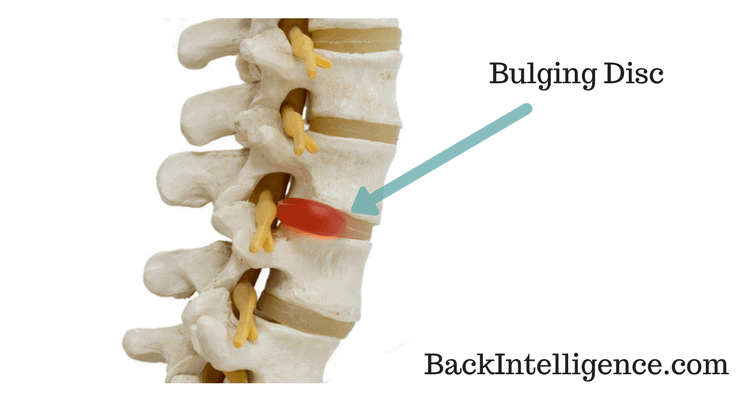 So, what is a bulging disc? To understand what a bulging disc is, we must first understand the anatomy of the spine. Put simply, the spine is made up of individual vertebrae stacked on top of each other. Between each vertebrae is an intervertebral disc that provides a cushion so the vertebrae don’t rub together. The discs between the vertebrae, have a gel-like material inside (called a nucleus pulposus). 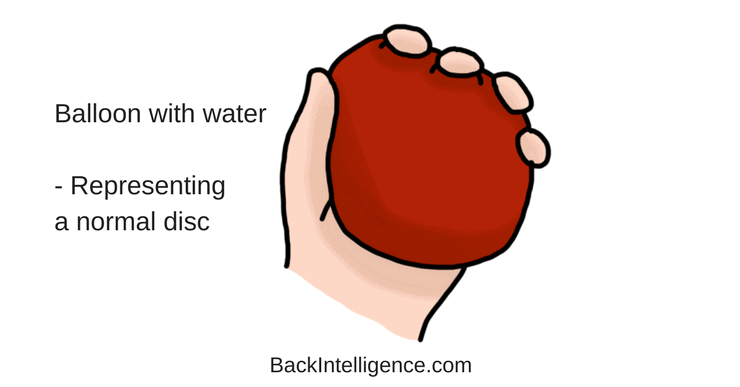 A great way to think of the discs is like that of a balloon filled with water, and these discs help resist compressive forces on the spine. 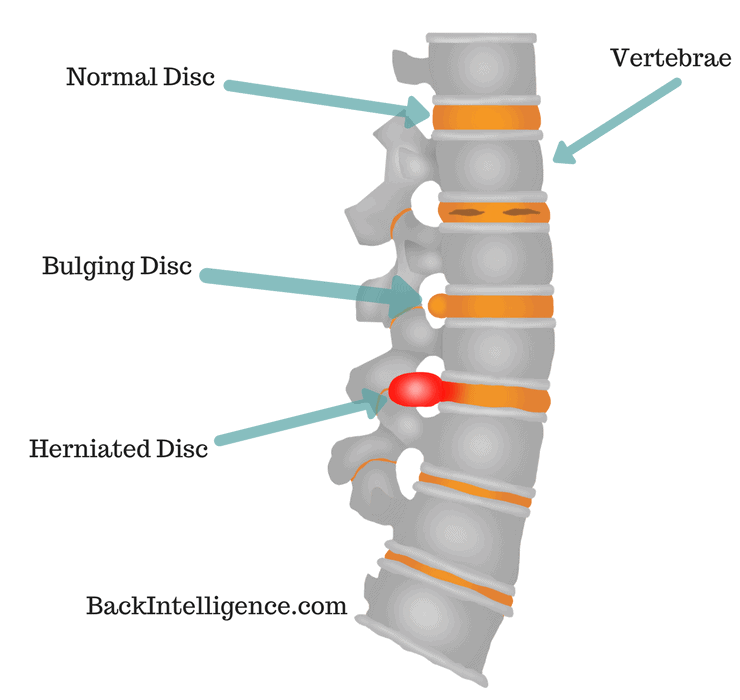 When a disc bulges the gel-like material inside of it gets pushed back towards the nerves and structures of the spine. This bulge can sometimes compress nerves in your spine and cause pain, tingling/or burning sensation, and/or other symptoms. ●	Repetitive bending, lifting, and twisting (Esp in poor form). ●	Heavy lifting with poor form due to stress on front of spinal column causing disc to bulge out back. ●	Can also result from Osteoarthritis. ●	Trauma such as a car accident. How is a bulging disc different from herniated disc? and which is worse? Now that we know what a bulging disc is, let’s discuss disc herniation. ●	In most simple terms, a herniated disc is when the fluid material from the disc ruptures through the outer layer of the disc and now spills out the back, which can directly compress on spinal nerves and spinal structures. 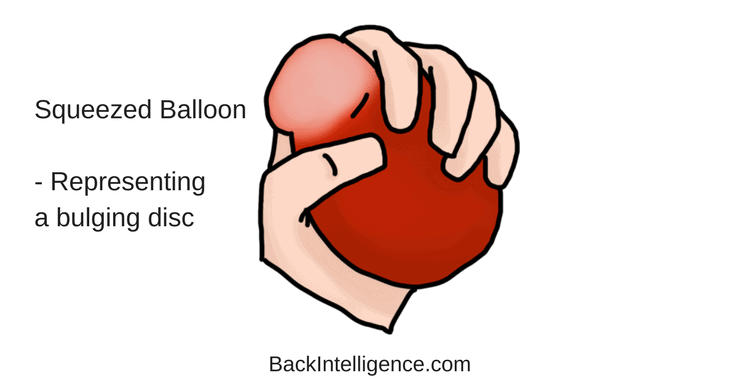 If you use the water balloon example from above, but now imagine the balloon has bursted under pressure – That’s a herniated disc. As you can see a herniated disc is worse. A bulging disc can be resolved over time if managed well, whereas the herniated disc will just scar down since the annulus (outer layer of disc) has ruptured. What are the Symptoms of a Bulging Disc in the Lumbar Spine? Leon’s Notes: There’s some research showing that a bulging disc can in fact be reversed with exercise and posture modifications. Meaning you could actually push back the disc material, so it doesn’t bulge. With most bulging discs in the lower back, you want to use an extension based exercise programs. This can reverse the direction of the bulge and push the fluid back into neutral alignment. It is important to also consider that 70% of people with low back pain get better regardless of treatment and 90% get better within 2 months of initial episode of back pain. Note: Always monitor your pain severity and location, if these exercises make you feel worse, stop doing them and try a different exercise or consult with your doctor. The exercises I personally recommend are listed below in the order I use with my patients. In the early stages of a disc bulge, your body’s natural response is to tighten up and protect the spine and buttocks area. Because of this, one of the the simplest things you can do yourself to relieve radiating back pain caused my a disc bulge is stretching piriformis muscle. 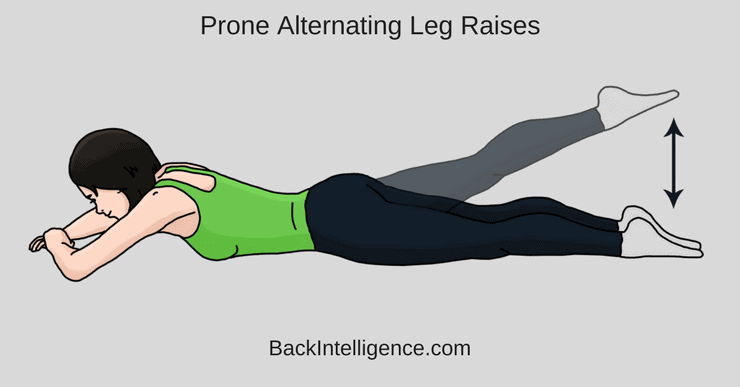 The prone leg lift creates spinal extension helping push the jelly-like material back towards the center and reduce bulging disc. ●	Lay face down with your palms on the floor under your forehead. ●	Straighten one leg then lift it a few inches off the ground with your toe pointed. 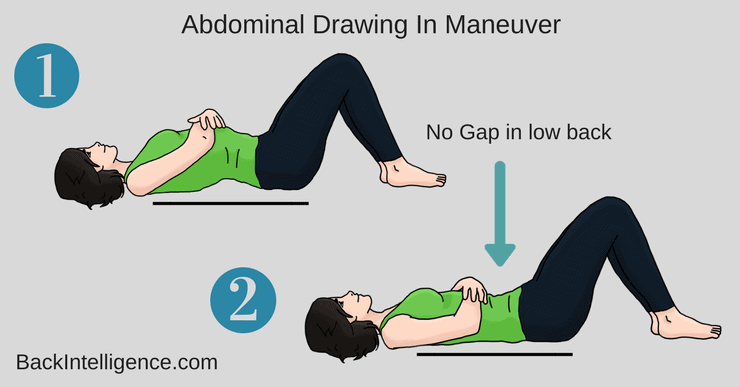 ●	Lower your leg to the floor with your knee remaining straight. The half cobra pose creates spinal extension helping push the nucleus (jelly) back towards the center and reduce bulging disc. 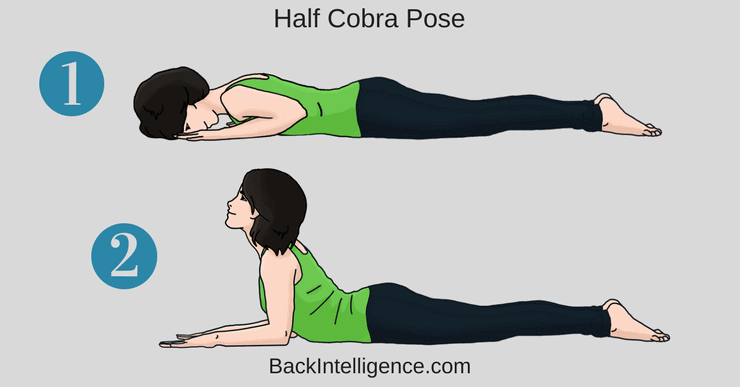 The full cobra pose creates even more spinal extension than half cobra helping push the nucleus (jelly) back towards the center and reduce bulging disc. A solid core foundation helps provide stability which in turn prevents re-injury and further injury from occurring. This will help reset the spine into neutral position. Other forms of exercise that may help, that were not mentioned above include walking, pilates, and yoga. Walking is low-impact form of exercise that has long been shown to reduce the incidence of low back pain Walk 30 mins 3-5 days a week . Yoga therapy can be safe and beneficial for patients with LBP or sciatica, accompanied by disc extrusions and bulges. Research has shown it to be just as effective as exercise in the management of LBP . 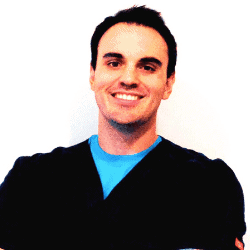 Seeing a primary musculoskeletal care provider is the best approach if your symptoms are not resolving. This includes DO/MD/DC/DPT. In many states, you can see a Physical Therapist (DPT) without a Physician Referral. 1. Meziat Filho N, Santos S, Rocha RM. Long-term effects of a stabilization exercise therapy for chronic low back pain. Man Ther. 2009;14(4):444-447. doi:10.1016/J.MATH.2008.10.002. 2. Evans C, Gilbert JR, Taylor W, Hildebrand A. A randomized controlled trial of flexion exercises, education, and bed rest for patients with acute low back pain. Physiother Canada. 1987;39(2):96-101. doi:10.3138/ptc.39.2.096. 3. Liddle SD, Baxter GD, Gracey JH. Exercise and chronic low back pain: what works? Pain. 2004;107(1-2):176-190. doi:10.1016/J.PAIN.2003.10.017. 4. Mazloum V, Sahebozamani M, Barati A, Nakhaee N, Rabiei P. Randomized clinical trial The effects of selective Pilates versus extension-based exercises on rehabilitation of low back pain. J Bodyw Mov Ther. September 2017. doi:10.1016/J.JBMT.2017.09.012. 5. Monro R, Bhardwaj AK, Gupta RK, Telles S, Allen B, Little P. Disc extrusions and bulges in nonspecific low back pain and sciatica: Exploratory randomised controlled trial comparing yoga therapy and normal medical treatment. J Back Musculoskelet Rehabil. 2015;28(2):383-392. doi:10.3233/BMR-140531. 6. Brinjikji W, Luetmer PH, Comstock B, et al. Systematic literature review of imaging features of spinal degeneration in asymptomatic populations. AJNR Am J Neuroradiol. 2015;36(4):811-816. doi:10.3174/ajnr.A4173. Sam we can’t give medical advice, but please check with your doctors if you’re clear to exercise again or not. 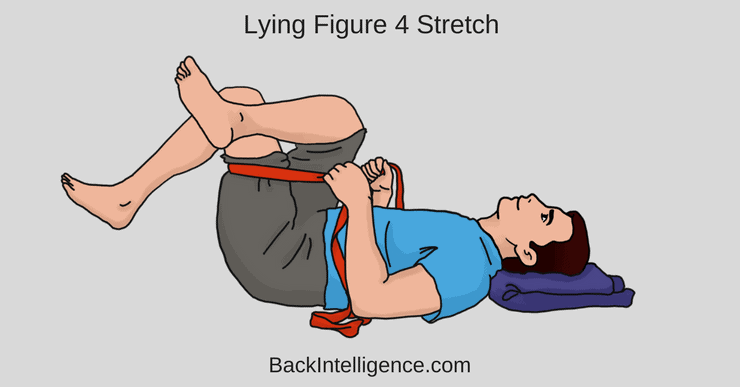 Also, you can try to see if any of the exercises alleviate pain symptoms and only do those. 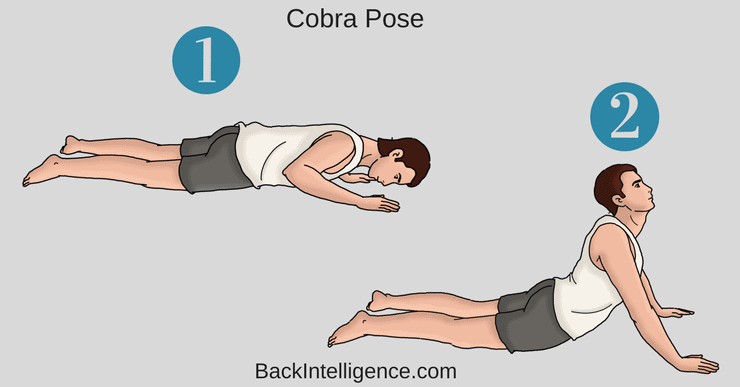 For example you can try the “Half Cobra pose” above to see if it feels better or not. If it doesn’t, then stop doing it.